Moreover sea surface temps show how 2015 and 2016 warming came from the oceans. 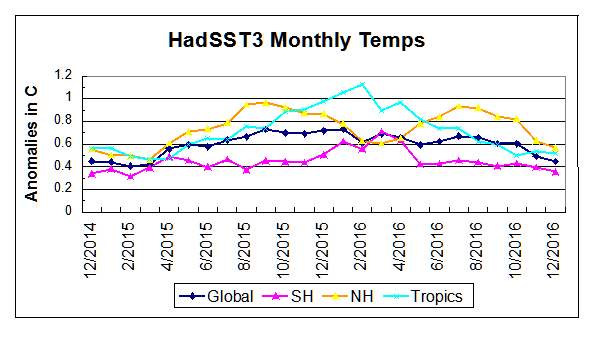 HadSST3 is now complete for 2016. Good point Ron. Climate obsessives will have to duck and weave even more to keep the man-made alarm narrative from sinking. There are very strong jumping SOI, which I think is a result of the descent jet stream from north to south. “Since Oct. 1, total precipitation in the Sierra Nevada has been soaring at rates similar to the wettest winters in the modern record: 1982-83 in the northern and central Sierra and 1968-69 in the southern Sierra. Ozone shows the course of the jet stream. Continued to rain in California. Another strong decrease in the speed of the solar wind. Visible stagnation in circulation in the Northern Hemisphere. Finally the wheels are definitely wobbling on the UN-IPCC and it unproven AGW meme of CO2 causing warming in the real world. Next to UK government to rescind all AGW actions and inform the UN that their theory, and the presumption about CO2, is wrong? In 600million years of the earth’s climate history with CO2 up to 7000ppm and no catastrophic run-away global warming has ever occurred. What else is needed?